You may remember my post about the garbage can wars with my next door neighbor, whom I call the “Garbage Can Nazi.” If you missed it, here’s the link below, just to get you up to speed. Just for the record, he never moved my garbage cans again. Unfortunately, during our three-week battle, the Garbage Can Nazi did weed-whack all of my sunflowers… well, all except for one. Did I mention that sunflowers are my favorite flower? There isn’t another flower that truly replicates the appearance of the sun. Just like a sunny day makes your mood brighter, so does a beautiful sunflower. 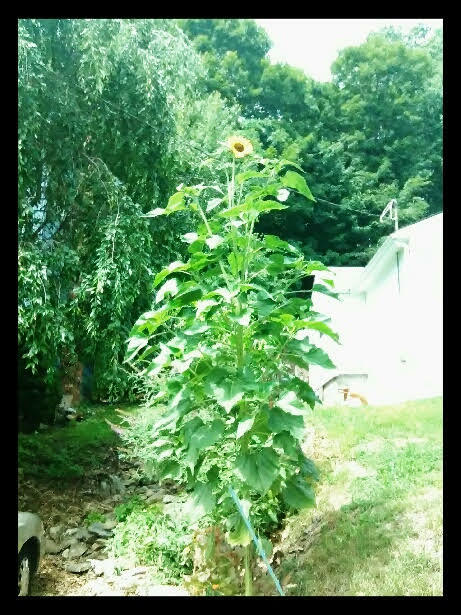 My one surviving sunflower has grown to be at least 8 feet high with a trunk as thick as a baseball bat. Personally, I think this little sunflower, grown from seed, is with me and flourishing just to spite the Garbage Can Nazi. Take that, “Garbage Can Nazi!” I win! And in the future, never piss off someone who writes a blog or underestimate the power and beauty of a single sunflower. Erin, I’m not sure if it’s just me, but the sunflower pic isn’t showing. Just fixed it. Try again. This flower is mammoth! It shows up but it’s really tiny and hard to see. I know, I was having trouble with my computer and my phone. Notice the green diagonal stake (at the bottom of the photo) this dude put in claiming “his” unsurveyed property line. Silly man…he can’t win against you. It will only be harder on him as time goes on. Still trying to fix it. I am so glad at least one survived! Trying to get the photo up. Yes, I can’t see it either other than a tiny little photo thumbnail size 😦 . I think you should place colorful happy face stickers on his trash bin!